Customer reviews are a well-established tool to understand the needs of your audience and promote your goods and services. Furthermore, consumers rely on peer-to-peer review before engaging with a company. The success of your digital marketing campaigns is also heavily reliant on customer feedback. Online marketers recognise the importance of publishing high-quality content to engage and retain audiences. Consumers want a unique experience they enjoy when they interact with brands. Yet few marketers understand what customers actually want. So why not ask your customers what content they want to see and how you can improve the customer experience across the board? At this point you may be thinking, ‘there is no point.’ Few people are committed enough to leave comments, testimonials or answer feedback surveys they receive in their email inbox and on social media networks. This is true. However, people are prepared to reply to SMS if the surveys invite simple responses or are compelling enough for customers to participate. Furthermore, customer reviews are classified as user-generated content. You can publish actual feedback to show you care about what your customers think and that your brand is committed to following through on customer suggestions or demands. It makes sense to factor review content into your content marketing strategy. Search engine algorithms use a long list of metrics to rank websites. Some of the most important metrics are the number of visitors a page receives, how long they stayed on the page and whether the information on the page prompted them to explore other pages on your website. These metrics are something you should consider in your overall content marketing strategy – but only if it is agreeable to customers. Don’t forget, most people want information and they want it fast. [One of your review questions can be how they want to locate and engage with content]. What many marketers have not realised is that user-generated review data has considerable impact on SEO rank. Google’s initiative is to reward brands that prove they are credible, authentic and deliver on their promise. 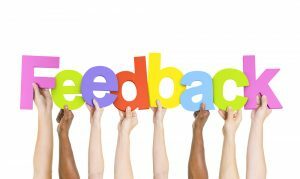 Quick-fire customer reviews are a simple solution to encourage customers to engage with your review questionnaire. Once you have some feedback, you can publish the results and share them on social media networks and SMS to encourage other customers and visitors to leave reviews and comments. As a result, the humble consumer review becomes one of your most powerful assets for improving SERPS. Increase organic search rankings, and you generate more clicks, more visitors and more conversions. These statistic clearly show the power word-of-mouth has on purchasing decisions. Furthermore, reviews are classed as user-generated content (UGC) and an increasing number of brands are publishing UGC because of the positive effects they have on decision making. Why use SMS to send customer reviews? SMS messaging receives an open rate of 90-98%. No other digital marketing tool has this kind of power to reach your audience. Furthermore, you can either invite customers to provide feedback directly from their mobile device and leave a link in the text to direct them to a relevant page on your website. Text messaging platforms therefore give you a platform to execute two strategies; one to generate content and the other to create a buzz around the content and generate more feedback. The best place to start is with your most loyal and valid customer. Make sure they understand the review is being offered exclusively to them because their opinion matters the most. There are also effective customer survey systems that can be integrated into SMS. Customer feedback tools make it easier for marketers to structure customer surveys. Furthermore, you can personalise questionnaires to make them more compelling. Getting feedback and garnering reviews from customers can be a challenge. Invitations sent via email and social media networks are often ignored whilst in-person questionnaires often leave you with insights that are not particularly helpful. SMS messaging, on the other hand, reaches more people and promotes a higher response rate that any other digital marketing method.